Sri Lanka's Foreign Minister met his German counterpart, Frank-Walter Steinmeier, yesterday at the German Foreign office in Berlin. 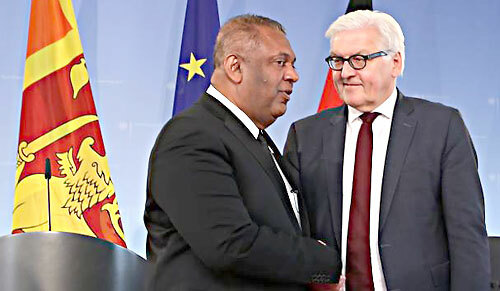 The German Foreign Minister warmly welcomed Samaraweera, hailing him as one of the "Architects of Change in Sri Lanka". Steinmeier acclaimed the political developments in Sri Lanka in the recent months and also mentioned that Germany was impressed by the high voter turnout in the presidential elections and also of the peaceful transfer of power and the reforms the new Government, is bringing in. Steinmeier assured Minister Samaraweera that Germany would definitely support Sri Lanka in its path of political and economic consolidation. Among his other engagements during his visit to Berlin the Sri Lankan Foreign Minister Samaraweera will be giving a speach at the prestigious German think tank DGAP (German Council on Foreign Relations). His will be speaking on, "Contours of a New Sri Lanka" .